Very few Christians have thought about where the Bible came from, or thought critically about the actual nature of the Bible. I certainly fit this description for most of my life. I blindly went along with what I was told about the Bible and never really stopped to think about it, where it came from, and how it was used. It is no surprise then that when I began my college studies in the Bible I was blind-sided by a lot of issues. As I learned about the development of the Bible and nature of the Bible, it seemed really troublesome to continue using the “Truth mine” approach, but this was all I had known. I wrestled with this for many years but really buried my head in the sand so to speak and avoided the real issues. However, the more I studied and thought about the Bible, the more the way I had been taught to use it continued to fall apart. I finally came to acknowledge that the way I was taught to use the Bible was incompatible with the Bible we have. 1. The biblical texts are a small part of a much larger pool of spiritual texts: The various books of the Bible are just a very small representation of a much larger pool of Israelite, Jewish and Christian spiritual writing. We know this because we have found copies of some of these spiritual writings while other writings, or concepts and stories contained in other writings, are referenced in the Bible while the writings themselves are not in the Bible. One example is the fact that Paul references a letter to church in Laodicea and encouraged the Colossians to read it…but we do not have a book in our Bible entitled Laodicean. Considering Paul alone, it appears clear, and it would make sense, that Paul wrote more letters than the handful of letters that appear in our Bible. The Issues: First, this begs many issues about interpretation. Considering Paul’s writing alone, we know he wrote many letters that did not make their way into our Bible. Were all of Paul’s letters inspired or just some? Second, if the Bible is a “Truth mine,” but the books that make up the Bible come from a much larger pool, how do we know where to stop digging? 2. The biblical books we have were selected from that pool: Traditionally the answer has been the only spiritual texts we are to mine eternal and divine truths out of, are those in the Bible. But who decided which texts from this large pool of spiritual writings made it into the Bible? The answer is that both Jewish and Christian religious leaders made decisions about what books were to be accepted and authoritative and which books were not as important, to be ignored, or even destroyed. The Issues: First, humans had a huge hand in this process of decided which books were authoritative and which books were not. Given human nature, I am suspicious that every decision in canon formation was Spirit led. Not all of these decisions were made from some widespread consensus and sometimes we have no reason why a particular book was rejected where others very similar to it were accepted. Second, even if this entire process was completely God guided and God protected, this process lasted at least a few centuries and it would be many more centuries before most Christians had access to the whole Bible in their language. If the Bible is the only authoritative guide for Christian belief and Christian living, what about the followers of Jesus who lived before they had access to the Bible? Did God guide them less than He did those who live today? Were they left to fend for themselves on many issues? Were they somehow “less” Christian than we are today because they did not have the right “biblical answers” to many of life’s questions? 3. There are different Bibles: To further complicate things not every Christian group agreed on the decisions that were made during canon formation. The result is that different Bibles exist. When I say Bible I assume most of my readers think of a bigger book containing sixty six different smaller books. However, this is just the Protestant Bible. The Hebrew Bible contains less books and is organized differently than our Old Testament. The Greek Orthodox Church and the Roman Catholic Church also have different books in their Bible we do not have. If we are to suggest that God guided and protected the process of which books made it into our Bible we must admit that for some reason He did not guide us into a unanimous position. The Issue: So if the Bible is a “Truth mine,” which Bible is the right mine? How certain are we, and how certain can we be, that our Bible (whichever Bible that is) is the right Bible? For Protestants, if all the Bible is filled with eternal and divine truth, then are we missing eternal and divine truths that are in Tobit or Maccabees? Are our Catholic brothers and sisters more informed or mis-informed because they have access to these books? 4. There are many different genres in the Bible: The books of the Bible contain a variety of different genres or styles of literary writing from different cultures. Poetry, erotica, Hebrew narratives, wisdom literature, parables, prophetic utterances, the Gospels, Graeco-Roman letters, Ancient Near Eastern political treaties, apocryphal literature and other genres exist in the Bible. Each of these genres has literary rules and conventions that govern them. Each of these genres has a different purpose in mind. Each of these genres has a different intention regarding how historically, literally, and factually they were to be read and understood. The issue: The “Truth mine” approach is a one-size-fits-all approach to these many different genres. This rides roughshod over the fact that the many differences within these genres. This is just as problematic as if I were to tell you to read every type of English and Spanish literature, past or present, 16th century sonnet or science fiction novel, 4th century canción or modern day script for a telenovela, as an English textbook on math. Sometimes we take a more nuanced approach, and for example do not build too many literal truth claims from the poetry of Psalms. However, why is it not okay to do this with the poetry of Psalms but it is okay to do it to the Hebrew narratives concerning the Patriarchs, the letters to various churches, records of visions from God, or the etiology stories in Genesis? A handful of select people (mostly scholars) who actually pay attention to this issue seek to reconstruct the literary rules these genres by comparing them to other similar writings we have found. However, this leads down a highly subjective road where there is room for debate and it would require every Christian (or at least every Christian teacher) to know these rules and apply them correctly. 5. There are inconsistencies and contradictions within the Bible: Anyone who reads the Bible from cover to cover will see that while many prophecies are fulfilled and there is consistency on a number of issues, there are also inconsistencies and contradictions. These are salted throughout the texts and are of varying degrees of importance. This is a graph of inconsistencies in the Bible. This is a link to Project Reason, the source of this graph and hi-res versions. 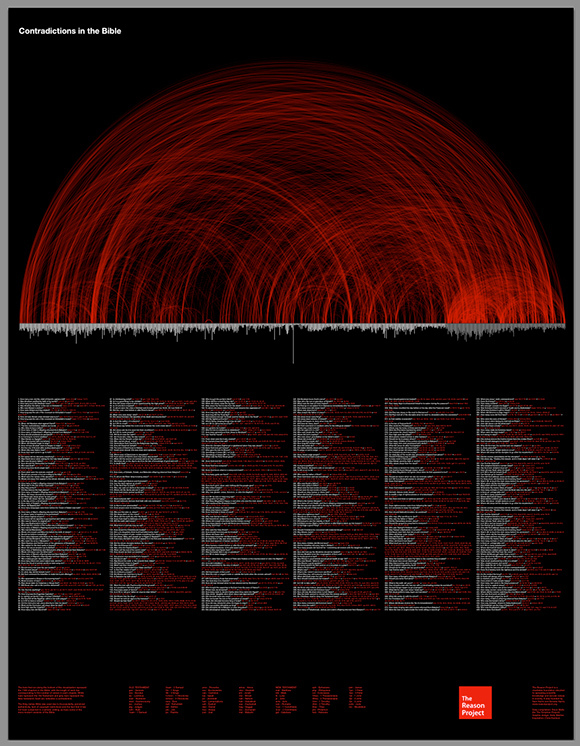 Every red strand in the image represents a statement that contradicts another in the Bible. Some of these contradictions are in minute details while others are of more importance or are more abstract in nature. The Issue: The issue for the “Truth mine” approach is quite simply that these inconsistencies exist. However one might explain them, there are a variety of subjects where the Bible says multiple things. How can there be one authoritative “biblical answer” to something if the Bible actual provides different statements about the same thing? 6. The biblical texts were written to and from cultures that no longer exist: The literature of the Bible is forever locked in cultures and languages that no longer exist. To further complicate matters much of these writings, especially in our Old Testament, were written over several centuries. During this time the people of God experienced many dramatic changes in their political, social, and religious life. The Issue: To get at a “biblical truth,” the “Truth mine” approach can either translate and obey the Bible literally, ignoring the change in cultures and the culture that any given passage was written to, or one can seek to understand what the words and sentences meant to their original readers to extract the “biblical truth” from the passage and then reason out its meaning and application for a contemporary reader. Both of these approaches are problematic. First, while the words of the Bible has stayed locked in time, the world has not. So if we take the Bible literally, with no regard for the fact that they were written to and from cultures that no longer exist, we are left with “biblical truths” that do not make sense, do not apply, or are even immoral in current circumstances? Second, if we attempt to reconstruct the context they were written to, find a “biblical truth” in there, and then apply it to the contemporary world today, we head down a very subjective and contextual path that can produces many different results for different contexts. 7. The Bible leaves much unexplained or unmentioned: In the Bible there is a lot of truth that is left unexplained and many issues that are not addressed. One example of this is the practices and teachings of the Nicolaitans mentioned in Revelations. Jesus judges condemns one church for falling into it and commends another church for avoiding it, so it seems important to understand what it was. However, the Bible does not explain what these practices actually were. On a bigger level, the Bible simply does not contain an exhaustive account of truth. Not everything that is true is directly stated in the Bible and the Bible does not have a clear unambiguous answer for every moral, ethical, doctrinal or practical concern that Christians have been, are, and will be faced with. The Issue: For the “Truth mine” approach, the problem is that not every diamond is in the mine. There are eternal and divine truths that exist that are not recorded in the Bible and there are questions the Bible fails to answer. How can we get the “biblical truth” and the “biblical answer” to some question from the Bible when the Bible does not have something to say on everything? If the Bible is our guide, what do we do when we fail to find guidance in its pages on a particular issue? 8. The Bible is open to interpretation: If God saw fit to inspire every word of at least some of the Israelite, Jewish and Christian spiritual writings, and then guided each of these writings into the Bible, it appears God has failed to guide the most important step: the interpretation of scripture. Any given scriptural passage can be read in a variety of ways. Additionally, through selectively reading scripture, mix-matching verses, and other simple tactics one can make the Bible sound like it is saying just about anything. The Issue: The fact that scriptures are open to interpretation make it difficult, if not impossible, for there to be one “biblical truth” about any given subject. How can one be sure that your personal interpretation of a passage or the interpretation of a passage that dominates your particular tradition is actually the correct one that is authoritative for everyone, including those who would interpret the passage differently? In conclusion, due to the development and nature of the Bible, I think it is incredibly problematic to approach the Bible as a “Truth mine.” Wherever this approach exists, be it at the core of Calvin’s institutes, the sermon of a pastor, or a cliché Christian statement that starts “What the Bible says about (topic)…,” such doctrines, teachings and statements are in my opinion highly suspect. Because of this, I would suggest maybe 20% of truth claims I have heard Christian pastors, theologians, and laypersons make are actually accurate. The rest has been either personal opinion supported with a biblical text, or a truth for a particular community in a particular context. [This is all pretty academic stuff, and I’m sure I lost some of my readers, so in my next post I want to discuss how the “Truth mine” approach is problematic at a practical level when it is actually used. This entry was posted in Class or Paper Take Away, Faith, Personal Commentary, Why do we believe... and tagged Bible, Biblical authority, biblical inconsistencies, canon, canon formation, Christianity, different Bibles, exegesis, genres in the Bible, inconsistencies in the Bible, Jesus, scriptural interpretation, the authority of the Bible, the Bible, truth, Truth mine. Bookmark the permalink.